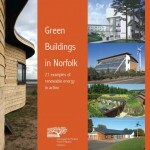 As part of a campaign to promote practical solutions to climate change, CPRE Norfolk organised tours of local buildings that use renewable energy and demonstrate low-impact construction techniques. A great variety of buildings took part– from barns to water mills, cottages to smallholdings, studios to sheds, environment centres to ordinary council houses – and each had something remarkable to offer. Green Buildings – CPRE Norfolk’s Guide to Energy Efficiency explains what technologies are available, which might be best suited to your home, a guide to how much they cost and, just as importantly other ways you can save money and reduce energy use around the home. 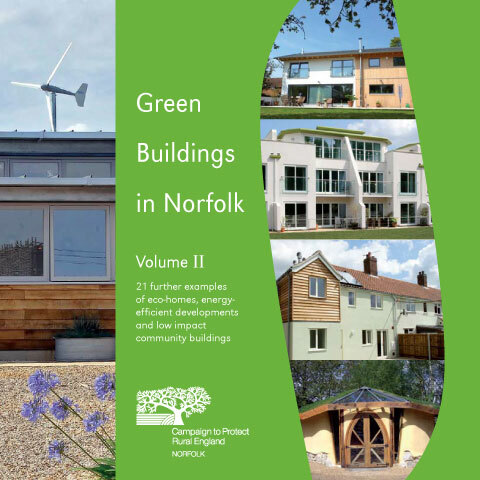 You can also read more about 42 of Norfolk’s greenest buildings in two full colour booklets: ‘Green Buildings in Norfolk – Volumes I and II‘ . Volume I features a social housing scheme, a backpackers’ hostel, a major office development, schools, a church, holiday accommodation, a research institute and many ‘ordinary’ homes together with a detailed appendix on different energy-efficient technologies and building techniques. Volume II, produced in 2010, continued the theme, with a further 21 projects featured including Itteringham Mill, Copys Green Farm, New Victory Hall, Greengauge Homes, Reepham Low Carbon Community Challenge and an inspiring collection of individual retrofits and self-build projects. A 10 Step Guide to Greening Your Own Home is also included.